Open the door to our fully-fiduciary financial services. Let's sit down together to make a plan for the prime of your life. We'll help you understand your finances from an informed perspective. Structuring your personal finances in a way that maximizes benefits and reduces risk can be an intimidating, confusing and time-consuming process. Since 1992, Locker Financial Services, LLC has been empowering their clients to take control of this critical area of their lives, armed with a plan that’s specific, straight-forward and sustainable. Come in for a complimentary meeting. Let’s talk about how we can partner with you to create a simpler financial future. The only fee or compensation we receive comes directly from our clients. That allows us to act as FIDUCIARIES, meaning we will always put our clients’ best interests before our own. As NAPFA members, we take an oath to do just that, every time. Ask us to provide you with a copy of our services and compensation brochure (Form ADV). It will let you see exactly how we operate. No surprises, nothing hidden. We ask every client a simple question – “What is it that you want to accomplish?” By listening carefully to the answer, we tailor our services to best help you achieve your unique financial goals and objectives. If you don’t know where you’re going, chances are you will never arrive. We arm our clients with the tools to confidently and boldly make the most of the challenges and opportunities that every life offers. True financial planning requires the adviser to take an holistic approach. We look at far more than just our clients’ portfolios. As applicable, we review and discuss household budgets, spending and savings habits, insurance requirements, tax obligations, higher education needs, retirement plans and estate issues. We cover all the bases so that you come away with a plan that realistically represents where you stand financially. We work in tandem with our clients to identify their specific goals, objectives and attitudes toward life and money. After carefully analyzing the personal and financial information you provide, we’ll present you with a structured and detailed plan that takes into account a spectrum of scenarios, variables and outcomes. At every juncture in this process, you’ll play a key role as an active partner in the work being done. Think of financial planning as a road map, a tool that allows you to reach your destination on time and with the fewest possible detours. Through the dynamic development of your resources, Locker Financial helps you smooth out the bumps that are bound to occur along life’s road. Let our responsive and diligent team assist you in setting a course toward a satisfying and worry-free financial future. We’re here for the long run to work with you as you implement your new financial plan in real time. We take care of the necessary paperwork and reminders, assist you in setting realistic goals and help you determine when course corrections are warranted. Because financial planning is not a “one-and-done” activity, we’ll be around when you need us, as we have been every year since 1992. 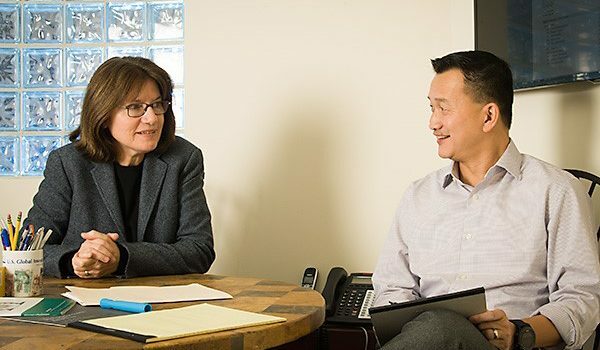 Lauren Locker and Andrew Chan are proud members of the National Association of Personal Financial Advisors, an organization that has pioneered a set of standards for advisor education, training and practice methods that truly serves the public interest. NAPFA members provide independent, objective financial advice to their clients, free of the conflicts that come with accepting commissions.